You are allowed to use this website, the Image Library and the Visual material made available, provided you fully comply with the General Terms and Conditions below. Stichting Van Gogh Museum, established in Amsterdam. The images, photographs, texts, data, information stored in the Image library of the Right Owner and offered to the User through this website. The data bank of the Right Owner containing the Visual Material, text, information, etc. as made available to the User, through the internet, or otherwise, in any form whatsoever. 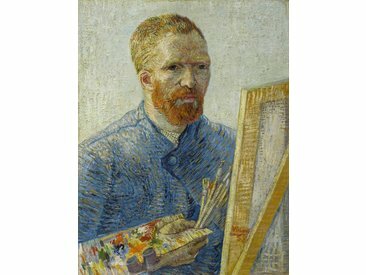 The User is the natural person or legal entity using this website and/or the Image Library of Stichting Van Gogh Museum. The Customer is the one who orders and/or buys one or more image(s) through the website of the Right Owner. Single use of the Visual Material by the Customer for the purposes stated in the order and through the medium as stated. 1. By using this website you agree to the present General Terms and Conditions. Use is understood to mean all and any acts performed by the User in respect of the Image Library, viewing, downloading, reproducing, quoting (a part) from the Image Library, such as the Visual Material, the texts and the other information. 2. The Right Owner only grants non-exclusive permission for Single Use of the Visual material for the purposes as stated in the order through the medium specified in it, as stated in the order confirmation, with due account of the so-called personality right of Article 25 of the Dutch Copyright Act. Permission for making available in a medium shall never involve permission for (simultaneous) making available in another medium. To reuse the material (for instance when reprinting the publication in which the Visual Material has been reproduced, when using the Visual Material in another publication and/or when using the Visual Material in another medium) or upon use for the sake of any purpose other than that stated in the order confirmation, a new order shall be placed. The Right Owner is free at all times to refuse an order. For any use of the Visual Material contrary to the terms and conditions stated in this article, the Right Owner is entitled to additional fees of 100% of the invoice sum, without losing any other right – including the right to damages. 3. Save as far as necessary for the use in the publication(s) stated by the Customer upon ordering and prior to explicit written permission it is not allowed to reproduce, sell, lend the supplied Visual Material in any manner, nor to make it available to third parties for free or under sublicense or otherwise. 4. Upon making available (copies of) Visual Material the Customer is obliged and held at all times to place the credits line, as stated in the Visual Material and/or forwarded in the PDF file with the digital image, in the immediate proximity of (the copy of) the Visual Material in a clear manner save otherwise agreed. Upon non-compliance with this condition 50% of the rate stated in the invoice shall be charged upon finding out, without loss of any other right, including the right to damages. 5. The Visual Material shall never be used in combination with, or as brand for pornographic purposes or for any purposes contrary to the law, public policy and/or decency. 6. Save stated otherwise, all the copyrights and any other rights of intellectual property regarding the Visual Material are vested in the Right Owner or in the legal entities or natural persons represented by the Right Owner. The User expressly acknowledges that the information given on this website is and remains the property of the Right Owner. Acquiring a (digital) use license regarding Visual Material does not involve transfer of property rights in the Visual Material. 7. In the event that the Visual Material concerns a reproduction of a piece of art upon which a copyright rests of the artist or his legal successors, it is the duty of the Customer to acquire the required permission for use from the copyright owner. In the event that the Visual Material concerns a picture of one or more persons, it is the obligation of the Customer to acquire any required permission of the person(s) depicted. 8. It is prohibited to use names, pictures or logos which are registered as trademark. 9. Posting a hyperlink to the homepage of this website is allowed, but posting an embedded link or framing this website is not. The website on which the hyperlink is posted shall disappear completely and the domain name of the website of the Right Owner shall be clearly visible. 10. The Right Owner is not liable for incomplete or incorrect information on this website. Any malfunctions or errors in the digital supply do not entitle the User to any compensation. 11. Nor is the Right Owner liable for any damage caused by or relating to the use of the Visual Material. In the event that the Right Owner must pay damages the sum of the damages shall never exceed the invoice sum for the Visual Material concerned. 12. This website can include links or references to websites of third parties which the Right Owner does not have any control of. The Right Owner is not responsible or liable for the content of such websites of third parties or for links in such websites. 13. By visiting this website you agree that the Right Owner does not bear any liability for any direct or indirect damage resulting from the use of (the information on) this website. Nor does the Right Owner accept any liability for services of third parties offered through this website. 14. The Customer shall indemnify the Right Owner against all and any third-party claims which might come about through the (unauthorized) use of the Visual Material by the Customer, including third-party claims founded on copyright infringement and/or infringement of the portrait right, and of all the damage and costs, including costs of legal assistance, which might result from this for the Right Owner. 15. The Right Owner reserves the right to terminate the agreement, without allowing any damages to be claimed, if the Right Owner does not have any opportunity to perform the agreement by reason of force majeure. 16. The Right Owner reserves the right to consider the agreement dissolved by law and without any prior notice of default being required in the event of bankruptcy and upon change of the legal status of the Customer. 1. When purchasing a user license for digital Visual Material the Customer obtains a non-exclusive license for Single Use of the Visual Material in the publication(s) and according to the terms and conditions as specified by the customer in the order. The license is restricted to the use of the medium, term, format, number of copies, area of distribution etc. as specified in the order. The supplied Visual Material shall not be reproduced, sold, lent or made otherwise available to third parties. 2. The Visual Material is supplied in high picture quality and in a specific size on the website of the Right Owner made available to the Customer. 3. The supplied Visual Material shall not be edited or changed in any other manner safe carrying out common color corrections and/or cropping the picture. 4. Payment shall be made through a Payment server which allows several payment methods. 5. The Right Owner does not guarantee that the Visual Material made available is suitable for the specified use and cannot be held liable for any deviation in color or image sharpness in the eventual print. To this end a reference print can be requested. 6. Upon purchase of digital Visual Material the User specified to wish to obtain the Visual Material after purchase and to waive any reflection period as provided in the Dutch Act on Distance Selling. That is why it is not possible to return the digital product once ordered. 1. The Right Owner recommends to request a match print as aid upon printing or converting the Visual Material for the print. Accordingly, the User will get a good impression of the eventual print result. Of course, the print result is subject to the equipment used. The Right Owner cannot give any guarantees for the eventual print result and is not responsible or liable for any errors in the printing result. It is prohibited to use the match print for any purposes other than as aid upon printing or conversing the Visual Material. The present terms and conditions apply accordingly to the purchase of a reference print. 2. The place of delivery is the place specified by the Customer when placing the order. 3. The times of delivery are by indication. The Right Owner is not liable for any delays in the delivery. 4. Any loss or damage of the Visual Material sent shall not be at the risk of the Right Owner save the Customer reports this within 14 days after a dispatch confirmation has been forwarded to the Customer. Failing to report this within this time-limit the risk will be for the Customer. In case of damage the invoiced sum and/or shipment costs will be repaid provided the article was returned within 7 days after receipt. 5. The Customer cannot cancel an order for a match print anymore once the order has been placed. The Right Owner reserves the right to amend these terms and conditions at any time. To the present General Terms and Conditions and the agreements concluded on this basis Dutch law applies. All and any disputes resulting from or relating to the present agreement shall be presented to the judicial body having jurisdiction in Amsterdam.